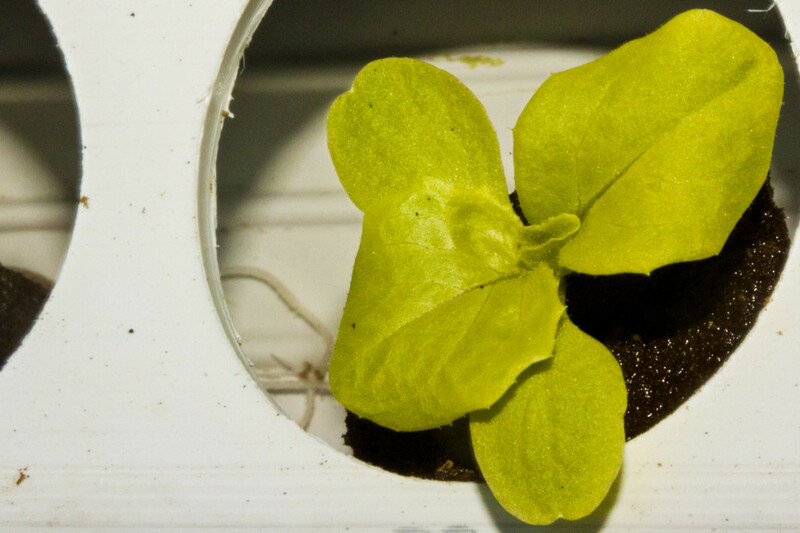 Hydroponics water management plays a very strong role in determining how sustainable and successful your hydroponics food gardens can be. In our last installment of our hydroponic NFT Grow Trials we were combating a small pest and a rising thermometer as the hot part of the season which until last few days had been a forgotten memory on Vancouver Island, BC Canada . We were trying really hard to avoid the use of a hydroponics reservoir chiller. Not because we didn’t have access to one, rather, we recognize the additional expense it could add in instances and wanted to make the experience we are sharing as universal as we possibly could. We demonstrated a reservoir management technique called purging to combat rising reservoir temperatures that had allowed us to avoid plugging in our hydro res chiller. 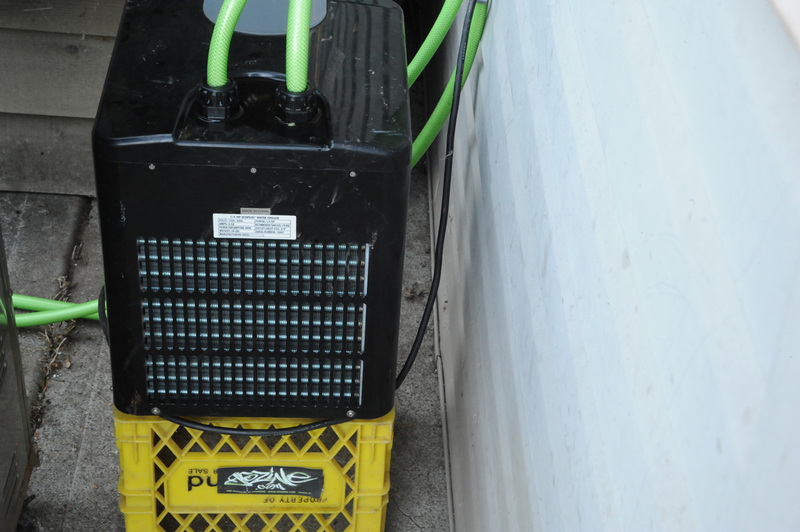 However, since we had the chiller anyways, lack spare time and don’t like wasting water if we don’t have to we decided to plug in our Eco Plus 1/4 HP Water Chiller. 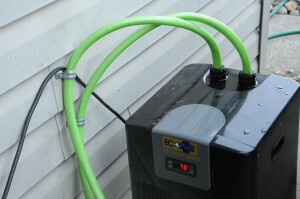 Note: Power use on a 1/4 HP Water Chiller designed for salt water aquariums and hydroponics is rather negligible. It uses a little over 180 watts when cycling, and on average during the hottest part of the season here, it’s only needs to cycle an average of 10 minutes per hour every 24 hours (during what is the hottest part of the year here). This amount of power could be supplied via solar or wind in “off the grid” hydroponics operations with relative ease and minimal expense, especially when compared to indoor growing power needs. less time is required monitoring and adjusting the reservoir; time is valuable. Now that we aren’t going to be purging water from the reservoir to keep it from warming up into the danger zone for our crop, we can focus on conserving water use. Note that we installed an overflow valve and discharge line to the high point of the reservoir fill level. The water purged from the res, which is super nutritious for our soilless growing beds, was redirected so it wouldn’t go to waste. 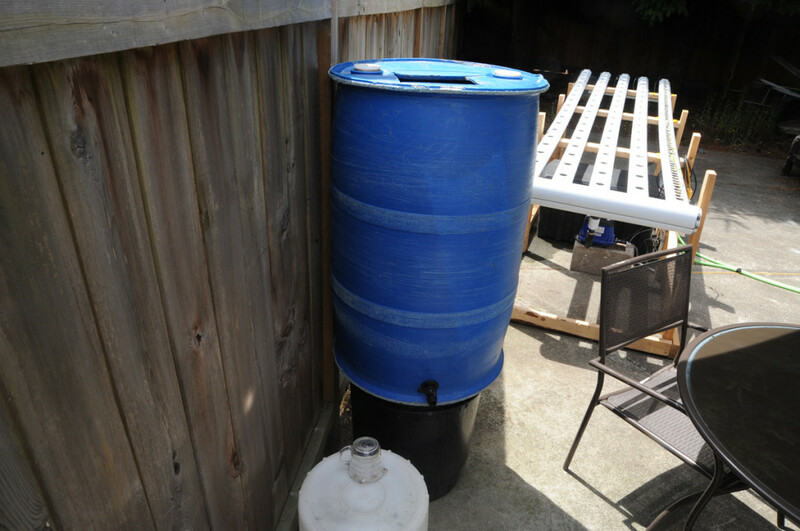 We scrubbed out an old food grade 55 Gallon Poly Drum with a little bleach and cold water, rinsing well and will be using this as our main water storage. We located the barrel out of the way, where nobody would troop over the water lines we plumbed to it using UnisSeals Rubber Grommets and common plastic plumbing fittings. 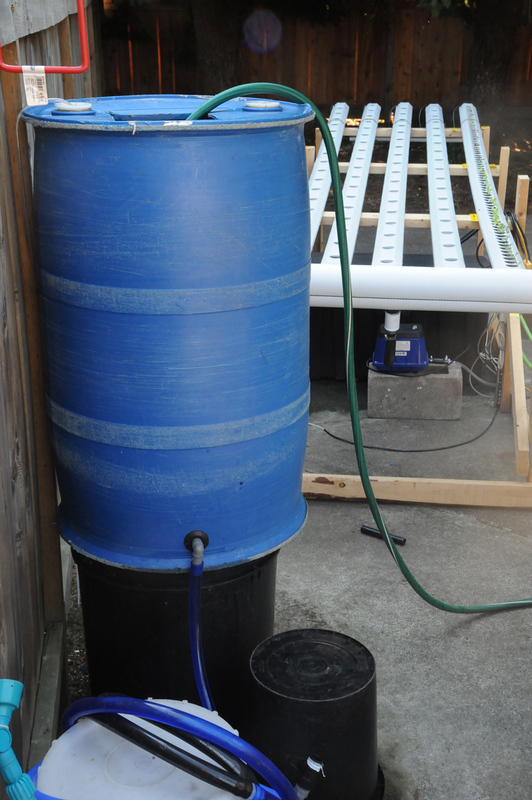 TIP: Try and keep your water storage vessel of out of the blazing sun. We found our patio umbrella helps keep the barrel from collecting too much heat from the sun during the hottest part of the outdoor growing season. We have got plenty of air power for aeration from when we supercharged our hydroponic NFT reservoir with elevated levels of oxygen from the air pump and air stone diffusers. Adding aeration to the water storage barrel was easy, we simply dropped an air stone in, ran another length of 1/4″ diameter air line and opened a valve-voila! A gravity flow watering hose was connected; so we can use the watering barrel for servicing the surrounding soilless beds we are growing other vegetable crops in. We still haven’t hooked up our float valve to the reservoir since we are around to check water levels. For the space it occupies, the NFT system uses noticeably less water on a daily basis. While the plants in the sytem are still small, there is are lots of openings, and far less moisture is lost to the air versus our soilless beds with similar plant size and counts. From what we have seen to date, hydro wins on saving water…besides the many other advantages over traditional or other soilless growing methods. 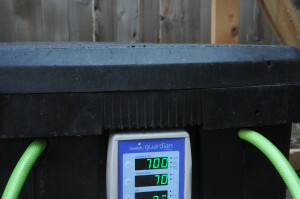 Less than 5 US Gallons Per Day has been required to keep the hydroponic reservoir at the fill line during the hottest part of the growing season. To further save on water, we are going to set up nearly identical water barrel where the downspout from the eaves troughs is located. With a debris filter in place, we can collect rain water when it is available and pump it over to our watering barrel as needed with relative ease. We were pleased to say the extra hour or so we spent on installing the chiller almost immediately made a noticeable difference in the appearance of the plants. It seems during the hottest part of the season, they too prefer their favorite brew nicely chilled. 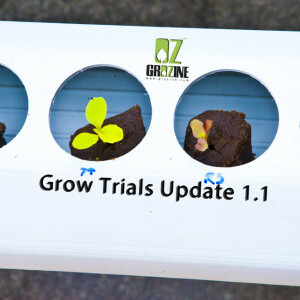 We’ll be back again soon with more updates, including our progress with our freshly seeded gourmet basil varieties that will be transplanted int the system along side our experimental summer NFT lettuce crop.